Gobble up Our November Calendar | Infomedia, Inc. 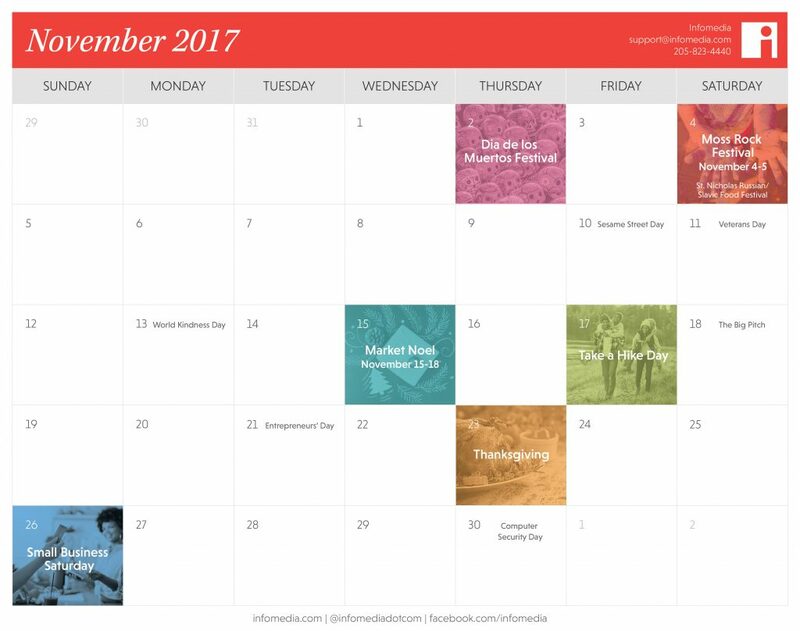 Whether November means turkey and trimmings, Black Friday planning or Iron Bowl shenanigans to you, this month is jam-packed with possibilities for your social media and blog content. Food, football and family and friends are a given in November, and there’s no reason your posts can’t share your gratitude. Shout out your clients and vendors, spread praise among your staff, and use our calendar to inspire you. Our calendar download provides access to fun local events and a few silly holidays to keep your content strategy fresh this month. If you’re looking for local happenings, look no further. The Moss Rock and Day of the Dead festivals are planned for the first week of November, and Market Noel is calling all shoppers November 15 through 18. Need a boost to your business? Meet up with like-minded entrepreneurs at The Big Pitch on November 18. Thinking broader? Celebrate World Kindness Day on November 13. If you’re looking for ways to spread kindness, our Random Acts of Kindness generator is a perfect place to start. Are you ready to liven up your Instagram feed? Or maybe just inspire your office culture? Then round everyone up for Take a Hike Day on November 17 — or just send them an email explaining why you appreciate them on November 29 (Electronic Greetings Day). Show your favorite local retailer love on Small Business Saturday (November 26). And we’d be remiss if we didn’t encourage you to change your passwords on Computer Security Day (November 30).